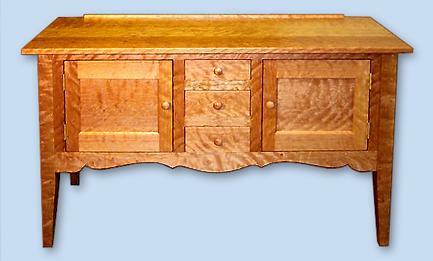 This solid cherry Shaker Buffet Server has straight tapered legs, three dovetail drawers and two flat panel doors. The dimensions are 58" long 34" high, and 19" deep. It is available as china cabinet with the addition of a hutch. While shown in cherry it is available in pine, curly maple, bird's eye maple, oak, flame birch or any hardwood. All of our other pieces are all custom hand made and one of a kind. They are all signed and dated. They can be built to any size with any finish or color desired.